What Causes a Cat's Tail to Constantly Twitch? Never underestimate the communication powers of a cat's tail. When it comes to communication, cats utilize their tails just as much if not more than their vocal cords. Don't wait around for a meow, chirp, purr, hiss or growl when you can simply glance over at your fluffy friend's tail. If your cat's tail is constantly twitching, take notice. If you observe that your cat's tail always seems to be twitching from the tip, perhaps you always catch your cutie when she's in a less than friendly mood. Maybe you pet her too much and she feels a little overstimulated, so she uses the twitching tail to indicate to you "Stop petting me for now. I'm just not in the mood. Try again later." 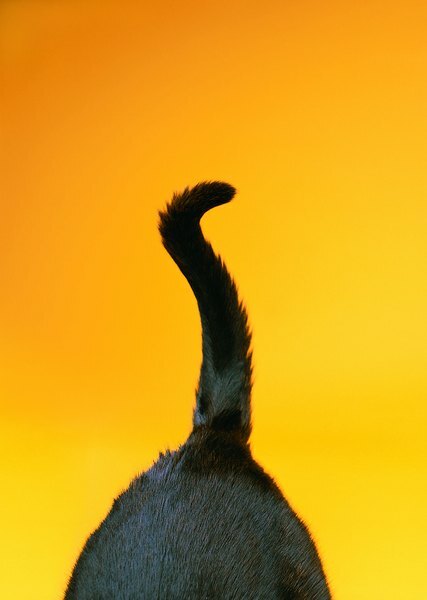 A twitching tail is very often the sign of an irked feline, so don't mistake the motion for being a sign of happiness. When a cat's tail is lightly switching, it may be a sign that she's currently in a thoughtful and uncertain mode. Perhaps she's debating her next move, whether it's to go by the window to gaze out at the birds or to head over to the kitchen downstairs to look for some yummy food. If your kitty's tail twitches a lot, you may have a deep thinker on your hands! When your cat's tail is quickly twitching, watch out, because it often signifies anger and intimidation. Maybe your cat is feeling threatened by another party -- whether a person or fellow pet -- and is prepared either to protect herself and flee or to launch a full-on aggressive physical attack -- yikes. If your cat's tail is constantly twitching in her day-to-day existence, think over her situation. Perhaps it's a sign that she has too much tension in her life, whether with another bullying pet cat or with a human household member. 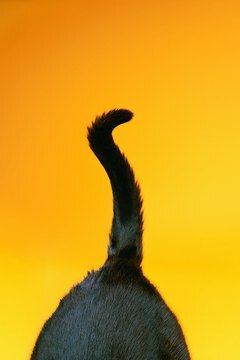 In some cases, a cat's constant twitching tail may be something that's beyond her control. Never rule out the possibility of medical issues. According to the Cornell University College of Veterinary Medicine, frequent tail twitching is a symptom of feline hyperesthesia syndrome, which is a compulsive ailment that is especially prevalent in senior kitties. Other key signs of the disorder include urination accidents and excessive scratching and grooming. Instead of just assuming that a twitching tail is an indication of feline mood, take your cat to the veterinarian to make sure the frequent movement isn't indeed related to any health conditions such as hyperesthesia syndrome -- the sooner the better. Why Does a Cat Flick Its Tail? What Is the Meaning of Cats Switching Their Tails? What Can Make a Cat's Tail Puff Up Twice as Big? What Does It Mean if a Cat Twists Its Tail? What Does It Mean When a Cat Won't Lift Their Tail? What Does It Mean When a Parakeet Shakes Her Tail?